For those like me. You're always looking for what little things one can find withing the game. 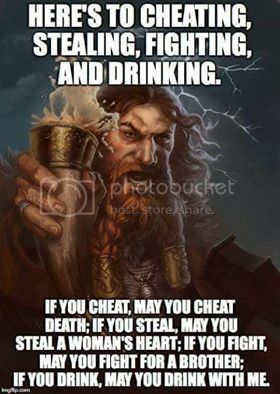 As such, I figured it would be nice to post our discovered here . Like the one I found on the Promenade Directory of the new Deep Space Nine. Feel free to share any other you may have run across. I noticed the viewscreen on the pillar where quarks opens into the promenade sometimes plays a video advert for the bar. Might have had audio but leeta was bellowing dabo at someone. For a hologram she has a big set of lungs. I found Cheif O'Brein's toolbox on DS9 yesterday. My Old Blog about things that could and should have been added when I wrote it. Not sure what I want to do with it now. I'll just keep it available now that most of it is outdated. If that list of gibberish has some funny in it, I can't see it. I'd love it if the Devs could give us a high rez pic of that directory. I've only run the swarm once, is it possible the planet was under attack in the 'liberate it from the Hur'q' sense? I mean, I know that's not very likely, but it would make this description make sense. Yoyodyne Propulsion Systems is there, too. Looks much the same as the directory in the show, as seen on Memory-Alpha. Though that pic is a bit low-res too they do have a text listing of the shops. Plenty of Easter Eggs in that basket. First one I spotted was the Sirius Cybernetics Corporation. Share and enjoy. I must admit to a certain amount of concern regarding the Forbin Project. > I noticed the viewscreen on the pillar where quarks opens into the promenade sometimes plays a video advert for the bar. > Might have had audio but leeta was bellowing dabo at someone. For a hologram she has a big set of lungs. Del Floria's taylor shop. man from U.N.C.L.E. Dont forget milliways“the dinner at the end of the universe”is also from the hitchhikers guide series of books. Nobody mentioned Jupiter Mining Corporation? I know I am not the only captain with a JMC Red Dwarf in this game. Uhm why'd you take this picture with a potato you found rotting in your kitchen? Did you not find the capture screen function on your pc yet? I went to DS9 this morning to try to read this Directory in the game hoping for a clearer image....but it is blurry in the game on my computer, too. Does anyone have a better computer can take a clearer pic? NEVERMIND I found jbmonroe's pic. Thanks! Banzai sounds familiar....so does Tom Servo. Though I can not place them. It is from the what's new section....you know the blinking question mark on the mini map. I am pretty sure the Hur'q not Jem'Hadar is the Swarm. OH...the entire list is on the Star Trek Wiki. List of vendors with links to descriptions is about half way down the page..just before "History". I found a Cardassian monk on Vulcan today. I should have checked closer on Risa while I was wandering around there. But I was mostly flying or on the water. LOL! Bonzai is from Buckaroo Bonzai across the 8th Dimension. Tom Servo is one of the robots om Mystery Science Theater 3000. 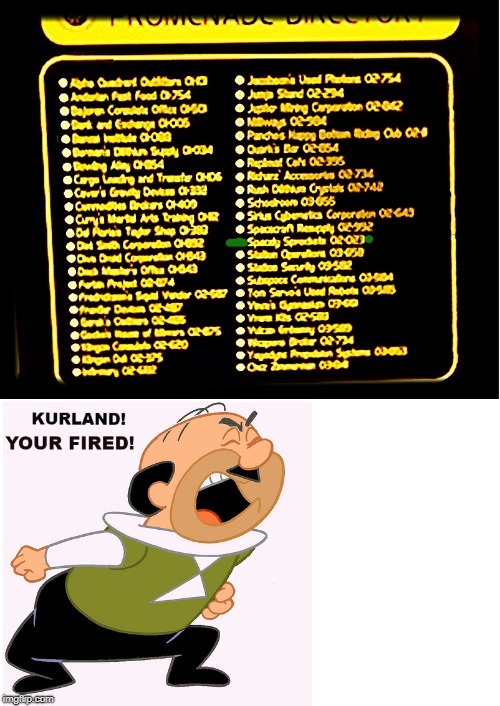 > I went to DS9 this morning to try to read this Directory in the game hoping for a clearer image....but it is blurry in the game on my computer, too. > Does anyone have a better computer can take a clearer pic? > NEVERMIND I found jbmonroe's pic. Thanks! > Banzai sounds familiar....so does Tom Servo. Though I can not place them. Tom Servo is from Mystery Science Theatre 3000. Tom Servo is one of the robots on Mystery Science Theater 3000. Well, I am not sure why Buckaroo Bonzai sounds familiar....because there was no way I could have seen that movie....it came out while I was in Basic Training. LOL! Eh, I never did like Mystery Science Theater...didn't like the side of running commentary with my Japanese monster movies. LOL!